Duly ignored was my polite request, addressed to Slate’s editors, to let me counter Mathis-Lilley’s lies over their pixelated pages. 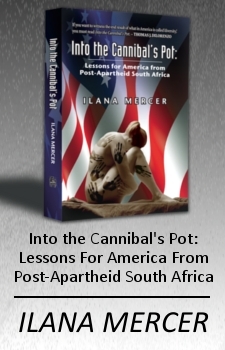 Why, for the “insanely unsubtle” “cover art of ‘Into the Cannibal’s Pot: Lessons for America from Post-Apartheid South Africa. '” “[I]nsanely unsubtle”: Mathis is no wordsmith. His choice of adjectives is positively Kardashian. Schooled in epithets, not argument, Mathis-Lilley goes on to claim that Steve Bannon uttered the “N-word,” and that, by extension, I was a sympathizer of such ugly language. Mathis-Lilley is a pig of a man (with apologies to pigs, which I love and do not eat). The woman he dubs “a real piece of work, racism-wise” worked tirelessly against petty apartheid. Accompanied by me, Ethel entered the Department of Home Affairs in Cape Town as a woman whose tribal marriage was unrecognized by the authorities, whose kids (in tow) were without birth certificates and whose decades of toil left her bereft of state benefits. When we departed the Department, that same day, Ethel and Jim, her husband of 25 years, had had their union solemnized by a grumpy magistrate, summoned at my insistence. And the children – bless them, they had dressed to the nines for the occasion – had birth certificates.